Corey Clement, born Corey Joel Clement, is a product of Glassboro High School and the University of Wisconsin. He is currently pursuing his professional football career with the Philadelphia Eagles. Apart from the niche he diligently carved for himself in high school, Corey stands out as one of Wisconsin’s football greats. While his stint in college lasted, he performed exceptionally great on the pitch, earning numerous awards and honors in the process. The Eagles’ No. 30 jersey player was born in Glassboro, New Jersey, on 2nd November 1994. The names of his parents are Steve Clement and Latanya Clement while the name of his elder brother is Stephen Clement. The youngest child of his parents, Cory studied at Glassboro High School, where he played football and also ran track. The running back represented the Badgers football team of the University of Wisconsin in college league although he originally committed to play for the University of Pittsburgh. The athlete is currently with the Philadelphia Eagles. He was signed by the football team on May 11, 2017, and made his debut for the side on September 10, 2017, in a game against the Washington Redskins. He managed his first professional touchdown in a game against the New York Giants on September 24, 2017. In all, Corey completed his rookie season with 4 rushing touchdowns, 123 receiving yards, 321 rushing yards, 10 receptions, and 2 receiving touchdowns. 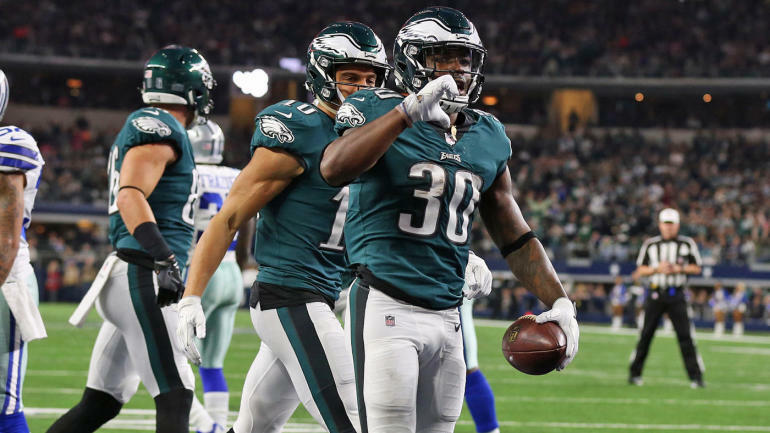 Corey Clement recorded 31 receiving yards in the Divisional Round game against the Atlanta as well as 20 rushing yards against the Minnesota Vikings in the NFC Championship. He announced his presence at Super Bowl LII by finishing with a touchdown, 8 rushing yards on 3 carries, and 100 receiving yards on 4 receptions in a game against the New England Patriots. It has been reported that the Glassboro native has a net worth of $2 million which he majorly built from his career. In 2017, Clement signed a three-year deal worth $1,675,000 with the Eagles. The contract guaranteed $35,000 and handed him $10,000 as a signing bonus. Corey’s base salary for 2018 is pegged at $555,000 and the amount is expected to increase to $645,000 in 2019. Corey Clement has someone he loves and the lovebirds have been together for some time now. The Eagles star’s darling is a pretty young woman called Micaela Powers. Powers is the daughter of American couple Terry Powers and Miriam Powers. She was born in Howell, Michigan, on February 8, 1996. Clement’s bae is a soccer star as well as a graduate of the University of Wisconsin, from where she obtained a double major in Sociology and Psychology. The 5 feet 8 inches beauty represented Wisconsin Women’s soccer team as a midfielder. Though Clement and Micaela are best of lovers at the moment, there are no signs suggesting that the wedding bells would ring anytime soon. Corey doesn’t belong to the group of players who have height on their side in the NFL, but it has never hindered his performance on the field neither has it impacted on his fast-growing career. Clement’s height is listed as 5 feet 10 inches (1.78 meters) and he weighs 98 kilograms (215 lb). While the American football running back has brown eyes and black hair, his other body measurements are hard to come by. While it is a known fact that the running back is so much in love with football, he has a list of hobbies that keep him busy in his spare time. The footballer loves watching moves/television series, reading magazines, playing video games, as well as training at the gym. His favorite actor and actress are Tom Cruise and Angelina Jolie. Corey Clement is a big fan of junk food and his favorite color is green. As gathered, the NFL star is a big fan of Beyonce, his best athlete is Tom Brady, and he loves dogs. To his credit, Corey has participated in a Super Bowl game. In his rookie season, precisely in February 2018, he won the Super Bowl LII championship along with his teammates. He remarkably caught a touchdown in the game which took place at U.S Bank Stadium. Before he kicked off his professional career, he was named to All-Big Ten First Team (coaches) and Second Team All-Big Ten (media); this was in 2016. Sometime in 2014, he was honored as the Big Ten Offensive Player of the Week and prior to that (in 2013), he made the 2nd Team All-Big Ten consensus list and was twice celebrated as Big Ten Freshman Player of the week.